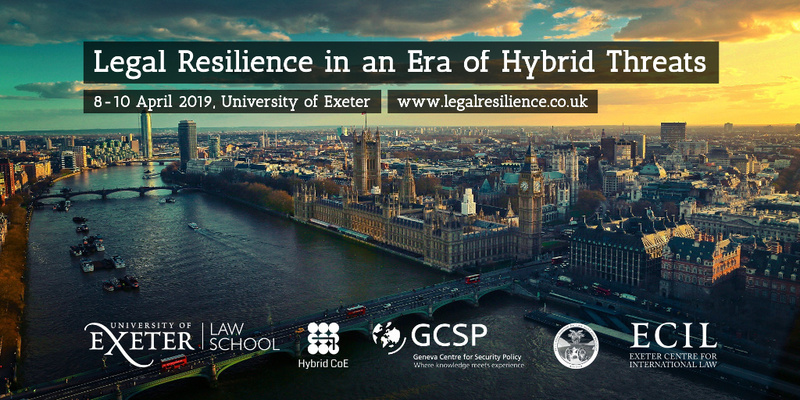 The Exeter Centre for International Law, in collaboration with the European Centre of Excellence for Countering Hybrid Threats, the Geneva Centre for Security Policy and the Lieber Institute, will host a conference on "Legal Resilience in an Era of Hybrid Threats" from 8-10 April 2019. The aim of the event is to explore the legal challenges presented by lawfare, hybrid threats and gray zone conflict, and to develop the notion of legal resilience as a framework for countering these challenges. 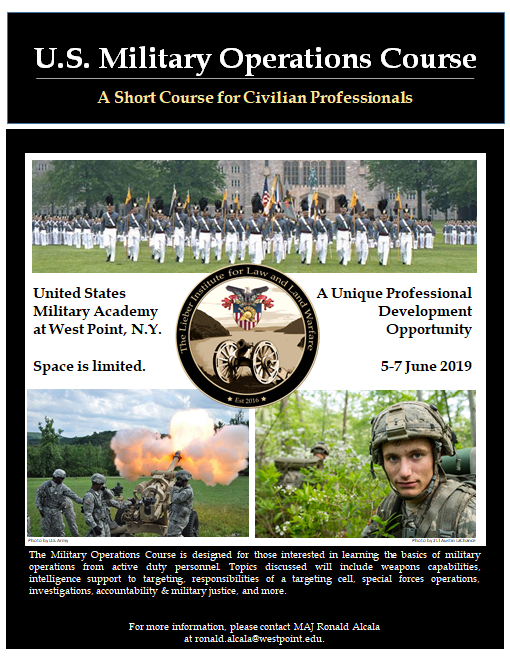 The Lieber Institute for Law & Land Warfare will host its second U.S. Military Operations course from 5-7 June 2019 at West Point, New York. The MILOPS Course is designed for those interested in learning the basics of military operations from active duty personnel. Topics discussed will include weapons capabilities,, intelligence support to targeting, responsibilities of a targeting cell, special forces operations, investigations, accountability & military justice, and more. For more information, please contact Major Ronald Alcala at ronald.alcala@westpoint.edu. From October 29th to 30th, the Lieber Institute for Law and Land Warfare hosted its annual Fall workshop titled, "Necessity and Proportionality in International Peace and Security Law." Participants discussed the ways in which the two fundamental legal principles of necessity and proportionality impact modern challenges associated with armed conflicts and international security. The workshop included legal scholars, experts, and practitioners from the United States and around the world. In its annual Fall event, the Lieber Institute hosted a workshop on "The Impact of Emerging Technologies on the Law of Armed Conflict." Participants discussed legal issues arising from the use of modern weapons systems, including unique problems surrounding compliance, accountability and targeting distinction. On February 7, 2017, the Texas Law Review hosted the Tallinn Manual 2.0 on the International Law Applicable to Cyber Operations Symposium, co-sponsored by the Robert Strauss Center for International Security, in cooperation with the Lieber Institute for Law & Land Warfare at the United States Military Academy. This day-long event featured panels addressing sovereignty in cyberspace, jurisdiction over cyber activities, international human rights law in cyberspace, among other timely topics. On October 24-26 2016, the Lieber Institute hosted its inaugural workshop on "Complex Battlespaces: The Law of Armed Conflict and the Dynamics of Modern Warfare." Particpants included law of armed conflict scholars as well as government and military practitioners from the U.S., Israel and the UK. Brigadier General Charles Pede, Assistant Judge Advocate General for Military Law and Operations, delivered the keynote address. On October 7th and 8th, the Carr Center for Human Rights Policy, part of the Harvard Kennedy School, and the Lieber Institute co-hosted a conference on the Strategic Consequences of the U.S. Use of Torture. Speakers included Dean Douglas Elmendorf of the Kennedy School; Stephen Rapp, former U.S. Ambassador-at-Large for War Crimes; Michael Posner, the Jerome Kohlberg Professor of Ethics and Finance at NYU and former Assistant Secretary of State for Democracy, Human Rights and Labor; and Alberto Mora, former General Counsel for the U.S. Department of the Navy. Philip Zelikow, White Burkett Miller Professor of History, University of Virginia, and former Counselor at the U.S. State Department, was the keynote speaker. On March 28-29, 2016, the Department of Law co-hosted a workshop with the Carr Center for Human Rights Policy, Harvard University’s John F. Kennedy School of Government. The event featured scholars and military practitioners (U.S. and British), who examined the role of torture from both a historical and modern perspective, to include incidents occurring in Iraq and Afghanistan. MG(Ret) Antonio Taguba, Abu Ghraib Investigating Officer, and Christopher Graveline, Abu Graib prosecutor, discussed their experiences with “Torture in the Public Eye.” Speakers also discussed the psychological consequences and victim impacts of torture. BG(Ret) David Irvine, Carnegie Counsel for Ethics in International Affairs, delivered the keynote address. November 16-18, 2015 - Syria: Can International Law Cope? On November 16-18, 2015, the Stockton Center for the Study of International Law at the U.S. Naval War College and the Center for the Rule of Law at the U.S. Military Academy hosted a workshop on the legal complexities surrounding the Syrian Conflict. On October 22-24, 2014, the West Point Center for the Rule of Law’s workshop on “Ukraine:On October 22-24, 2014, the West Point Center for the Rule of Law’s workshop on “Ukraine: A Case Study in the Viability of International Law,” brought together 21 preeminent legal scholars, military practitioners, and government representatives to identify the emerging jus ad bellum and jus in bello issues stemming from Russia’s actions in Ukraine. This was the world’s first meeting of legal scholars to address this topic.